Booker declares: Young white Americans are way too rich! Cory Booker (D-Twitter) isn’t letting go of his ‘baby bonds’ idea to redistribute massive amounts of wealth from wealthy AND middle class Americans to low income families. What’s new? He visited Al Shartpon on MSNBC this week to reveal that his plan actually has as much to do with racial identity politics as anything else. 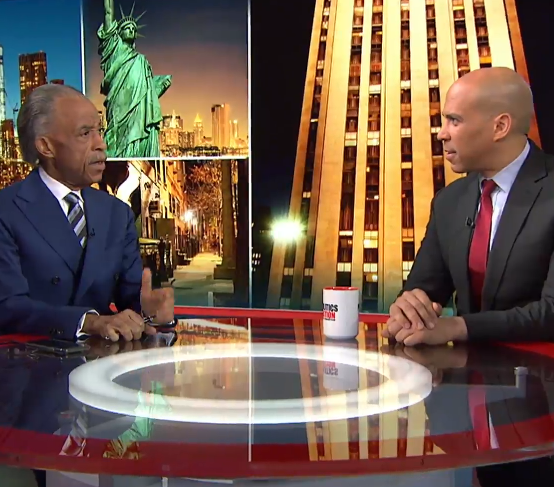 Put simply: white kids have too much $$$ (he calls it ‘implicit racial bias’), so presidential candidate Booker says he wants to take they and their families’ money and give it to non-white kids. Remember: the federal government can print money but it cannot create real wealth. If Booker wants to give free money to one group of Americans? He needs to take it from another. Now he’s (finally) admitting where he’ll get it. How he’d define non-white were he to make it to 1600 Pennsylvania Avenue? God knows. The SJW crowd can’t even agree on that point. But that’s the plan. Am I the only one that finds millionaire Al Shartpon of Tawana Brawley (and IRS) infamy talking about “unity” and “civility” AND economic equality more than a little ridiculous?!?! Click here to skip to the video. A 2018 survey found New Jersey LEADING the nation in millennials living at home with their parents. Spoiler alert: many of them are white, and they’re not at home because the cooking is THAT amazing.